Hops: Saaz, Cascade & Northwest Golding. [Original rating 2013-06-18] Draft at the PDX bar. Served in a big heavy goblet. Pours clear dark gold.with almost no head. Aroma is citrus, spice, apple, sweet malt. Taste is similar, bitter hops up front, then sweet, then back to bitter for the finish. I’m glad the wife encouraged me to get one more before the flight. Beautiful clean copper apperance, one finger of not so beautiful off-white foam. Malt, caramel, hop. Challenging. American hops, with a lot of resinous. In the taste a lot of malt and caramel, then an intense hop, grapefruit and piney. A lot of piney in the aftertaste too. Then tangerine, citric, and floral notes (some geraniol). Long, long hoppy aftertaste. Pine, tangerine. My absolute favorite imperial IPA. This is NOT a beer to have with your meal, as it should be savored all by itself. I was fortunate to have it served on tap at The Strange Brew in Manchester NH, but alas, it is only distributed in bottles now. If you like full bodied, medium malt, heavily hopped and complex big bears, this should be on your bucket list. Cheers! Mixture of gold and amber in the appearance, small 1/3" white head. Aroma is lots of pine and citrus, orange. Big bitter c hops all up in the taste, its one of those 100+ ibu type of ipas. The alcohol is big but not overpowering, you just gotta show it some respect. Really comes out as it warms. Its a sticky resinous, kind of viscous kind of ipa, the mixture of Cascades with some Saaz type of hops is interesting, but ultimately seems like they just went big without any fine touches on this one. 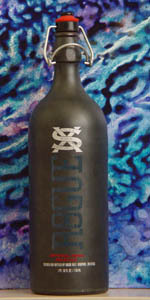 A 750ml ceramic and wingtop bottle with no bottled on or best by date. Poured into a Spiegelau IPA glass. Appearance: It poured a hazy amber orange copper colour with a one finger dark-ish cream coloured head that dissipated fairly quickly but left nice lacing. Aroma: Sweet caramel malts with juicy orange, tangerine, grapefruit and pine. Taste: Much like the aroma, sweet citrus tangerine and orange, some light caramel followed by bitter grapefruit pith and pine. The finish is a nice lasting citrus bitterness. Overall: This was a pretty good Double IPA with a good balance between sweet and bitter. A little more carbonation would have been good, but nonetheless still nice.